Two sold-out world premiere screenings of The Trials of Muhammad Ali had audiences discussing the film until the theaters kicked them out, and have also received rave reviews from the first critics to see it. You can catch it next at the Montclair Film Festival this Sunday, May 5th. Writing in the Los Angeles Times, Steven Zeitchik compares the film favorably to recent fiction Jackie Robinson biopic 42, stating "In its portrayal of a hyper-confident motormouth, "The Trials of Muhammad Ali" leaves a clear impression. The fighter shook up America--and its assumptions about race--by being the opposite of Jackie: always talking, always reacting, always provoking." For his Docutopia column at Sundance Now, Anthony Kaufman noted that the film's "focus primarily on Ali’s fights with the American establishment over his chosen Muslim identity... makes for a shrewd and provocative post-9/11 commentary," and that "with a vast collection of archival clips and interviews, the film moves along at a swift clip while raising thorny questions about race and religion in this country." The Hollywood Reporter's "bottom line" on The Trials of Muhammad Ali is "an invigorating doc brings the long-forgotten controversy to life," with critic John DeFore announcing that "the film captures the thrill of Ali's personality even for viewers with little interest in the sweet science." J. Hoberman at ARTINFO praised the film as a Tribeca stand out that "successfully melded the personal with the political" in covering the "transformation from clownish [Cassius] Clay to Muslim warrior Muhammad Ali." In a superb interview with Democracy Now! last week, the film's director, Bill Siegel, stated that "this isn’t a boxing film, but it is a fight film." That focus on Ali's personal beliefs was also noted by Steve Kopian at Unseen Films, who exclaimed: "THE TRIALS OF MUHAMMAD ALI is simply put the best film on Ali the man that I've seen... The film will move you. One of the best of Tribeca and the year." For Reel Life with Jane, Melanie Votaw called the film "an endlessly compelling story that isn’t just about Ali but about a period in American history that every kid should learn about." See more images from the red carpet. 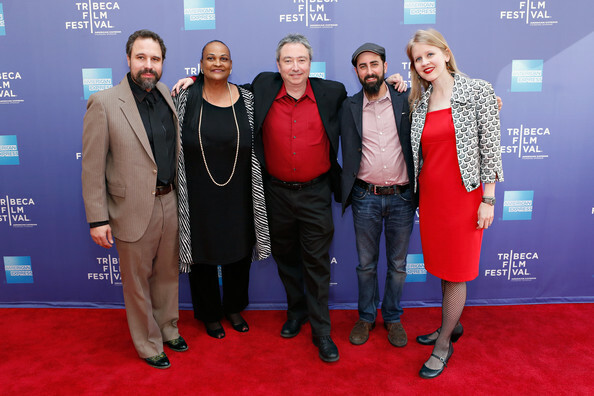 Above image: (L-R) Composer Josh Abrams, Khalilah T. Camacho-Ali, director Bill Siegel, editor Aaron Wickenden and executive producer Justine Nagan attend "The Trials of Muhammad Ali" World Premiere on April 26, 2013 in New York City. Source: Cindy Ord/Getty Images North America.